Frostbite - Just exactly what is frostbite? What is frostbite? During the cold weather season there are several things you really need to seriously take into careful thought when considering your outside pets. One possible hazard many owners may not even think about is frostbite. Just exactly what is it? This happens whenever any animal (including humans) sustains any kind of damage to their skin tissue. This is often due to an injury, but it can also be due to exposure to extremely cold or freezing temperatures over a prolonged period of time. The parts of the body most likely to be affected by this are the ears, the tail and the feet. Our bodies respond to exposure to excessive cold temperatures by reducing blood flow to those outer extremities - like the fingers and toes in people, and in the ears, toes and tails of dogs. In this way our vital internal organs are kept in the best possible shape while sacrificing the blood flow to those outer extremities. This diversion of blood flow in the body is the main reason that the chances of frostbite increases in the ears, toes and tail. Without proper blood flow, damage to these these body parts is a high possibility. Oftentimes the symptoms are not immediately apparent, and can be minor or very severe, just depending on the severity of the exposure, whether or not the animal was injured, etc. Unfortunately, it may take a few days before you begin to notice the signs. In the beginning, tissues damaged appear fine, like nothing is wrong - probably even normal in appearance. Within as little as 48 hours, however, the damaged tissue will swell and become extremely painful. Within only a few days, the affected tissue dries up, turns black, and eventually falls off, due entirely to the interruption of the affected animals blood flow and nerve supply in those affected areas. Many of the symptoms of this include the following: skin ulcers, pain and swelling, skin discoloration on the toes, tail and ears, blisters and sloughing of the skin. 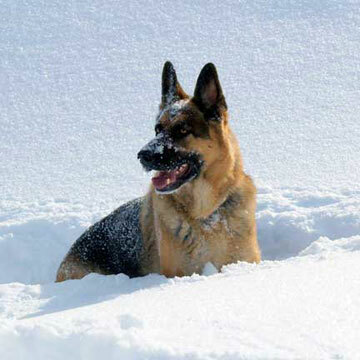 In minor cases usually only the ear tips are involved, however more extreme frost bite may result in the loss of the tail or other appendages such as the toes or even limbs. Death is also a high possibility in extreme frost bite cases as is possible amputation. How do you treat this? If you suspect that your dog has possibly gotten frostbite, Do NOT rub the affected areas at all! Probably the best thing to do is to quickly thaw the frozen tissues with warm (103-105¡ F) water but I would certainly advise contacting your veterinarian for more advice on how to further take care of this condition. Pain relief medication and antibiotics are usually prescribed after treatment is started. If you have a young puppy, a sick dog or a much older dog, don't leave it outside in the cold snow, rainy sleet, or cold winds for extended periods of time without supervision. Also, if your dog is old, arthritic, sick or has a very thin coat, let him sleep inside when the temperature drops below freezing. If your dog is exposed to chemical ice-melting compounds on driveways, sidewalks, and streets while outside please remember to wipe the feet when you get back inside so your dog will not lick the chemicals off when cleaning the paws. If your dog normally lives outside, has a thick double coat, is very healthy and well fed, is used to all sorts of extreme winter weather and has a sheltered place to get inside and out of from the wind and rain, he can probably stay outside no matter what happens weather wise. Overall, I think the best treatment for this is obviously prevention. If you err on the side of caution then hopefully you and your dog will never have to deal with the pain of frostbite.